I've written a couple of times about Jason, Adam's friend, who is in Iraq. Well, Jason's family has come up with a chance to support the troops. Gary, who is Jason's guardian, bought a bunch of boxes and printed up labels with the names and addresses of the twenty-two members of Jason's company and started handing them out. He's already handed out two complete sets and is on his third. I asked him to send me the list. I went to Curves yesterday to work out and they want to hand out the boxes. Today I'll get twenty-two boxes and print up the labels and take them to Curves tomorrow. I think part of the reason for the strong response is that the women at Curves tend to be middle-aged, like me. And a lot of us remember Vietnam, and the way the vets felt. This is our chance to make sure that mistake isn't made this time. Bob and I have been sending stuff to Jason--letters, coffee, a box of Harry and David snacks and cookies--but the idea that all the guys in his company could get that kind of support just tickles me. Anyway, I've got the address list and if anyone would like to adopt a marine, feel free to send me an email at mcq@en.com and request an address. You'll have to supply your own box. But it's a fairly cheap way to make yourself feel good. Suggestions for filling the box: Magazines, books, cds, video games, headphones (they break easily) gameboys, disposable cameras, snacks (but not chocolate or caramel, the 110 degree Iraqi summer makes them gross) baby wipes, squirt guns, toys, and a note saying who you are. Another banal post, hopefully slightly livened by a Wallace and Gromit reference. The weather is fabulous after nine days of rain. The path where I walk crosses Tinker's Creek twice. Each time there is a bridge. When I was coming up to the first bridge this morning, a deer was coming across it towards me. The deer froze, about two-thirds of the way acrtoss the bridge, head lowered, only it's ears moving. I could see it was trying to decide whether to bolt back the other way and I felt obscurely guilty...so I turned away, as if I hadn't seen it. Which was ludicrous since we had made deer/human eye contact. But I heard it's hooves on the tarmac and when I turned back it had finished coming across the bridge and was disappearing into the underbrush. Also seen, a tiny dead mole, lying on it's side as if asleep, one pink paw like a zipper pull on a suede coin purse. On my walk today I found myself following a guy I've seen a lot. There's sort of a community of walkers in Twinsburg. Besides the usual dog walkers, there's the Nazi girl, a very thin girl who walks ferociously, a fierce, unhappy expression on her face. She wears a sports bra and sweat pants in the summer. Walking does not appear to be a zen experience for her. There are the Wandering Sikhs, two retired gentlemen who are prodigious walkers. Bob and I have seen them in our neighborhood when we were, say, leaving for dinner, and an hour and a half later seen them still walking, four or five miles away. I admire the Wandering Sikhs a great deal. And there's the litter guy. The litter guy walks all year round in all sorts of weather. He wears a caution orange vest and often walks on the side of the road. He carries a plastic bag and a litter picker-upper thing with an American flag on it. Sometimes he is accompanied by a black and white border collie. Sometimes he has a handlettered sign that says 'Please Do Not Litter!' He is also a prodigious walker. I've passed him before and once asked him where his dog was. 'Too hot for the dog,' he said. Today when I went for my walk it was the third day of Seattle rain. I haven't been to Seattle but this is what I imagine Seattle rain to be like. Steady. Like it could rain for another century or so. Everything is green and just a little cool. There were a couple of runners--because this kind of weather is about perfect for running--but only one other walker, the litter guy. I followed him for awhile on the trail, then cut off to do my five sets of stairs. (There's an observation deck overlooking Tinker's Creek and if I am feeling like I should, sometimes I go up and down the stairs--about the equivalent of going to the third story of a house--five times. If I am feeling especially athletic, I do it again on my return leg.) When I got back on the path after doing my stairs, I soon met the litter guy doing his return leg. He had an ingenious harness that allowed him to wear a golf umbrella attached to his vest and resting on his shoulder to that the whole umbrella rides perfectly to protect him. When he saw me, he spread his hands. 'Can you believe this?' he said. I thought he meant the rain. 'Hands free!' he said. I admired his umbrella rig. I was wearing my new rain jacket and although I like my rain jacket a lot, it was a bit hot and the umbrella rig was splendiferous in a way a rain jacket is not. I thanked him for picking up litter. He told me he started walking in early 2001, when he was still living in Massachusetts and that he walked seven miles a day. Since 2001 he has walked 8000 miles, he said. He used to have sponsors--the local Domino's Pizza and Dunkin' Donuts, among others, and people would sometimes stop and give him twenty dollars and say, 'Go buy yourself a beer!' He was written up in the local paper. But other people thought he was a nuisance and the cops stopped him six times. People tried to run him off the road. When he came here to Ohio, he kept a lower profile, but he still picks up litter. Today he had found a five dollar bill. If I'd had my camera, I'd have taken a picture of him, but I keep forgetting my camera. Got to Mumbai around 11pm local time. Got through immigration and customs with no problems. Walked out into the heat and humidity and found my driver. Then I had a terrifying ride through Mumbai at night to the hotel. OMFG! No rules, no enforcement, half the cars had no headlights. I lost track of how many times we came within centimeters of trucks, taxis, motorbikes, pedestrians, and dogs. Saw one cow. People everywhere! Milling about on piles of dirt. They walk in the street because there are people living on the sidewalk. I saw buildings that had no front walls with people living in them. Like there had been an earthquake. Saw blankets thrown over wires (might have been power lines) to make tents with people living in them. I just wanted to get to the hotel without seeing somebody run over or crushed to death. Seriously, I lost track of the close calls. So I'm safe, a little wired, but drained. I'll write tomorrow. Lots of things have been happening. They're just really boring to talk about. Guess what, exercise improves health and mood! I cleaned some a kitchen cabinet! Made turkey sausage and white bean soup and it was good! And healthy! I think if I had to read this stuff I'd lose my mind. Or just stop reading. On Mondays and Thursdays I try to take my mother out to Bob Evans for lunch. My mother was born July 1, 1915. I am a late child. 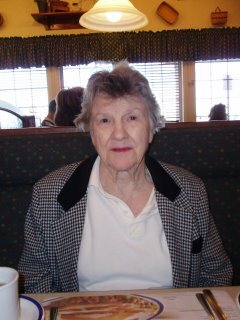 My mother has dementia, which is a polite way of saying she is senile, although she doesn't seem to have Alzheimer's, Parkinson's or any other specific cause for it. She loses odd things. Today I watched her eat her meatloaf and mashed potatoes with a long-handled ice tea spoon. Sometimes the array of silverware baffles her (although she has never eaten with a knife--in fact, as far as I can tell she does not use a knife at all these days.) She sorts through her silverware, arranging and rearranging it. Moving it on to her napkin on the left side of her plate. A moment later, moving the fork to the right side and carefully inserting it between her iced tea and the plate, even though this means shoving it under the lip of the plate. She is sorting. Sorting. Sorting. Making sense, I think. Stardust Holiday is the blog of a woman who is doing a twelve week NASA study at the Cleveland Clinic. She has to be in bed for twelve weeks with her head tilted six degrees down. Periodically she gets subjected to tests--she reports that the suspension is fun. During spaceflight an astronaut experiences many effects on his or her body due to the effects of microgravity. The 6 degree head down position simulates microgravity that occurs in space. The purpose of this research study is to determine if zero gravity exercise can serve to prevent loss of bone mineral density and muscle during 12 weeks of complete bed rest, and by extension, during 12 weeks of space flight. This sounds like torture. Laurie Anderson once compared space flight to being stuck in a station wagon with other people for a long time. This adds the caveat of being stuck in bed in a station wagon with other people for a long time.